Matt Harvey was a non-entity to me his freshman year. He started on the weekends, but I was much more concerned with the bullpen, with Alex White and Adam Warren, than I was with the Harv. To the point where I have more photos of Buster Posey (two), who didn’t even play for Carolina, than I do of Matt (zero) from that year. 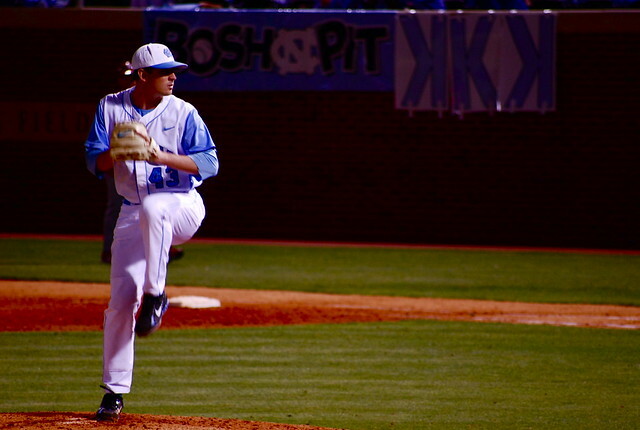 He could have been a name, I suppose — he was one-third of what was to date the best Carolina pitching signing class. 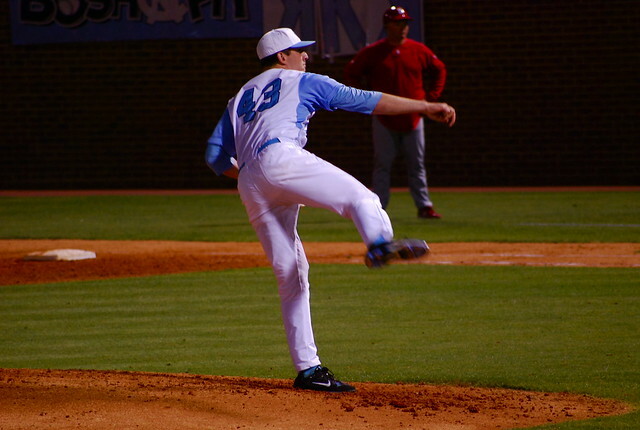 His classmates were meant to be Madison Bumgarner and Rick Porcello, who both obviously signed first round contracts and never enrolled at Carolina — but can you imagine? They’d all three still be in the majors now, Bumgarner would still have his ring, Porcello would probably still have seen at least one World Series, and that’s what they would talk about on broadcasts: college teammates, Harvey, Bumgarner, and Porcello, you know? But he wasn’t. He was the Sunday starter. 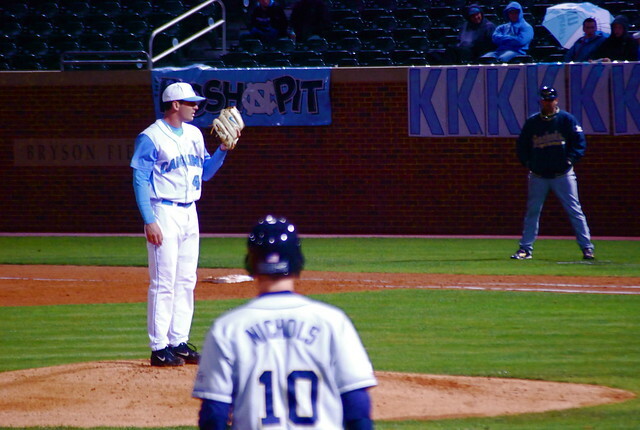 He helped the team go to a third straight College World Series. I barely remember him. I call this photo the Matt Harvey Walk Of Great Shame And Despair. 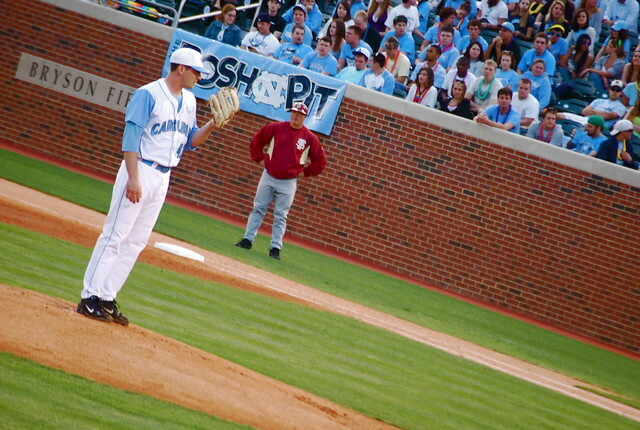 He’d just been totally ineffective in four and a third or so against NC State, and that photo expresses everything about Matt Harvey’s sophomore year that made me completely, totally insane. Brilliant, infuriating, ineffective, spoilt. He spent a lot of time talking to pitching coach Scott Forbes (21) and a series of infinitely patient catchers, including Dodgers AAA farmhand Tim Federowicz, who hated talking to pitchers so much he would actually walk to the back of the mound and clean his cleats instead of participate in a conference, as well as minor leaguers Jesse Wierzbicki, Mark Fleury, and Jacob Stallings. Then, somewhere along the way, he settled down in his junior year. 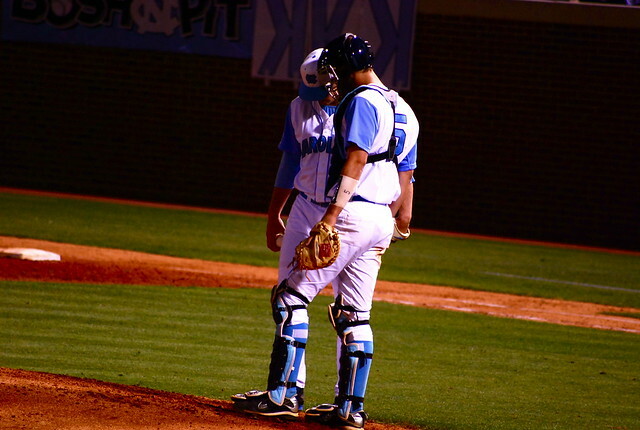 He needed more pitches, ran more counts full than would make me or scouts happy, but his junior year, he was steady. He wasn’t reliable, per se, but he wasn’t such a walking trainwreck. He might only hit one guy a game. And he quietly, sneakily, became the sort of leader that year’s team needed. It was raining this night. We were playing Georgia Tech. As you can see, he was having a good night, this early season ACC game in his junior year. The Ks behind him, you know. I think he struck out 8 or 9 that game. He lost the game, though. This photo, on Flickr, is captioned Angriest Harv Face, because the final was 1-0, or 2-1, and whatever the winning run was, it was unearned, runner reaching on E1, because the grass was slick and the Harv’s feet just flat went out from under him trying to field a mediocre bunt. He sat on the ground for a minute, that time, and you could see his resolve shape. This was the only game he lost his junior year. He was a rare junior on a young, talented, untried team that won more than it lost but was certainly not the College World Series caliber teams he’d played on the two years before. He was stubborn, fierce, pitched late into games and threw, probably, too many pitches. He tossed temper tantrums on the mound when Coach Fox tried to pull him from games. 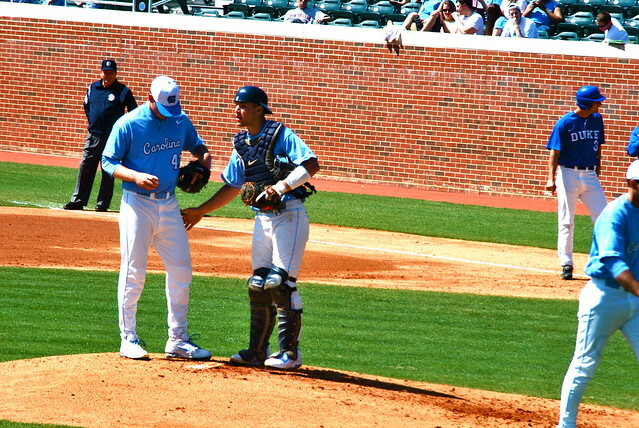 He hurled his glove at Scott Forbes in the dugout tunnel, final game of the season against Virginia, on regional television, after being removed from a game in the 10th inning. It’s a joke about a joke, at this point. Every time I roll my eyes about Matt Harvey taking no-hitters into the seventh, I’m rolling them with affection, the affection of having watched someone grow up in front of you. I bag on Matt Harvey because I watched him grow up. He can win the Cy Young and I’m still going to roll my eyes and go, remember that time he left the Maryland game in the first inning? Because if I don’t remember what came before now, when it comes to Matt Harvey, the way he made a conscious decision to grow up, who will? Everybody can marvel at him, but only shep. 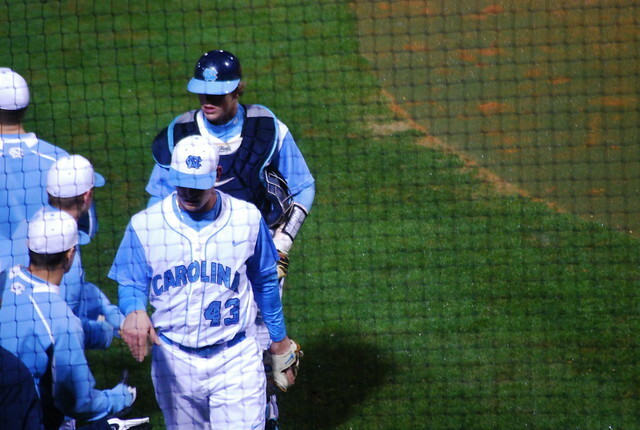 and I remember the time he hit three Duke batters in the first inning. Matt Harvey has become a star, but you need to know where he came from to realize exactly how impressive that is. Grant Bisbee sounds off on the Harv becoming an event pitcher here.